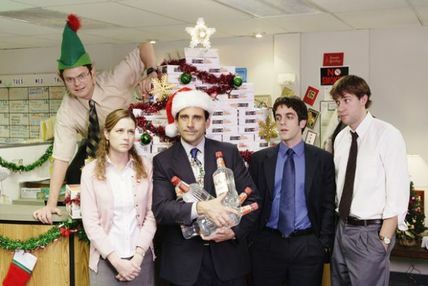 Never-ending Christmas parties, get-togethers with friends from out of town, drinks with co-workers for the sake of the ‘holiday spirit’… No wonder the couple weeks leading up to Christmas cause more weight gain than any other time of year… combined! 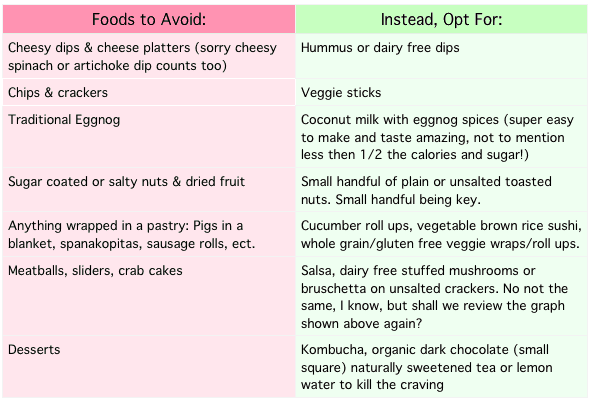 I posted this graph from examine.com on my other blog Healthy Alternative Holiday Dishes I wanted to post it again here in case you missed it because it absolutely blew my mind. 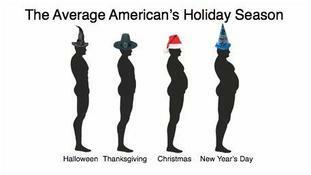 The average person’s weight gain triples in the one month of December and takes up to 7 months to lose that weight. Ummm, no thanks. Delicious dip fried appys, never-ending treat tables, and thick traditional sweet sippers….Yeah, there’s not much health or clean eating that goes on at these shindigs. So why do we eat them? Because they’re there. Right in front of our faces screaming ‘eat me! You deserve it!’ The truth is, you probably do, or did. The first ‘treat yourself’ evening: totally OK to slip up every now and then. Second indulge: Ok, extra workout for you tomorrow. Now that its the 3rd, 4th, 5th? Time to put the sugar cookie down. So how do we stop ourselves from going overboard? What are the healthier options commonly found at parties? How do I bounce back after one too many gingerbread cookies dipped in rum and eggnog? There are a few simple tricks we can do to prepare ourselves heading into a party where we know the spread will be chalk full of calorie bombs. I touched on this very topic in my How To Avoid Summer Weight Gain blog. Read more here. Eat before you head to the party so you’re not showing up starving. Drink plenty of water throughout the day to help avoid the water retention that comes from eating high sodium foods. If it’s a potluck, bring something hearty and healthy that you can enjoy and will keep you satiated and satisfied. Don’t stand around the food table. Make a small plate and walk away. Make a vow to yourself before heading to the party that you won’t be eating any foods that don’t support your goals. Make this statement firm and stay true to your word. I find that saying the statement ‘I do not eat those foods’ in my head, rids the cravings and temptation right away. I am not contemplating whether I should have them or not. I’m not bartering with myself comparing how much I worked out this week and that if I just have one it’s OK…A mind game we play with ourselves way too often. Just say no and move on. I promise you’ll leave the party not only feeling great about your decision but so much stronger as well. So now we know how to prepare when heading to a party, but what about when we get there? What are the worst food most commonly found at holiday parties? And what should we have instead? OK, I slipped up. Now what? How Do You Bounce Back After Indulging? Don’t get down on yourself. Sometimes the self-induced stress you conjure up after a sweet tooth takeover can do more damage than the actual item itself. Keep your head up high, shake it off and move forward. Begin and end your day with warm lemon water. You should be including this in your everyday routine anyways but especially when trying to bounce back after a diet mishap. Workout and sweat. Do your best to get a good sweat on every day to assist your body with ridding unwanted toxins. Exercise and infrared saunas are a great options! Include greens. LOTS of greens! Fresh, organic veggies for the win. Fill your diet with homemade soups, salads dressed in homemade dressing and green smoothies. Keep digestive enzymes on hand for the moments when you do slip up or overeat. Digestive enzymes aren’t something you want to rely on but they’re a great option for situations like these. Give your digestive system a break. After a big food based gathering I will take the next day to take a breather. I’ll sip on a large green smoothie throughout the day and have a vegetable clear broth soup at night. When January 1st comes, you should already have hit the ground running. If you’re wanting to lose weight, feel healthier, more energized and overall more positive in your day to day life, starting practicing these habits now. Just like any worthy results, practice makes perfect. If you are serious about your goals, giving up a few treats and old traditions here and there will be ‘aint no thang’.